A varied-line-spacing switchable holographic grating is demonstrated through a changeable interference pattern recorded in polymer-dispersed liquid crystal. The pattern is generated by the interference between one plane wave and another cylindrical wave. The line spacing and the period of grating can be controlled by varying the distance between the cylindrical lens and the grating sample and by changing the exposure angle between the two beams. Experimental period measurements and calculations show good agreement with the theoretical results. High diffraction efficiency of more than 80% for the middle period of the grating has been achieved under appropriate exposure time of 120 s and intensity of 19.1 mW/cm2. In addition, the diffraction can be switched on and off by virtue of the external driving voltage of approximately 120 V. The grating also possesses a fast response with a rise time of 300 μs and a fall time of 750 μs. This grating, which can change the period in the grating structure to allow switchable diffraction of transmitted light, shows great potential application for diffractive optics. M. Moike and T. Namioka, “Plane grating for high-resolution grazing-incidence monochromators: holographic grating versus mechanically ruled varied-line-spacing grating,” Appl. Opt. 36, 6308–6318 (1997). Y. J. Xie, X. D. Xu, Y. L. Hong, Y. Liu, S. J. Fu, S. P. He, and B. K. Jin, “Fabrication of varied-line-spacing grating by elastic medium,” Opt. Express 12, 3894–3899 (2004). L. Poletto and G. Tondello, “Spherical-grating monochromator with a variable-line-spaced grating for synchrotron radiation,” Appl. Opt. 39, 5671–5678 (2000). V. N. Strocov, T. Schmitt, U. Flechsig, L. Patthey, and G. S. Chiuzbuaian, “Numerical optimization of spherical variable-line-spacing grating X-ray spectrometers,” J. Synchrotron Radiat. 18, 134–142 (2011). J. Lou, S. J. Fu, X. D. Xu, and S. P. He, “Design and fabrication of holographic variable line-spacing gratings for position sensor,” Acta Phys. Sin. 55, 6405–6409 (2006). T. J. Bunning, L. V. Natarajan, V. P. Tondiglia, and R. L. Sutherland, “Holographic polymer-dispersed liquid crystals (H-PDLCs),” Annu. Rev. Mater. Sci. 30, 83–115 (2000). Y. J. Liu and X. W. Sun, “Holographic polymer-dispersed liquid crystals: materials, formation, and applications,” Adv. Optoelectron. 2008, 1–52 (2008). S. Bronnikov, S. Kostromin, and V. Zuev, “Polymer-dispersed liquid crystals: progress in preparation, investigation, and application,” J. Macromol. Sci. Part B 52, 1718–1735 (2013). M. S. Li, A. Y. Fuh, J. H. Liu, and S. T. Wu, “Bichromatic optical switch of diffractive light from a BCT photonic crystal based on an azo component-doped HPDLC,” Opt. Express 20, 25545–25553 (2012). L. Petti, P. Mormile, and W. J. Blau, “Fast electro-optical switching and high contrast ratio in epoxy-based polymer dispersed liquid crystals,” Opt. Laser Eng. 39, 369–377 (2003). A. E. Fox, K. Rai, and A. K. Fontecchio, “Holographically formed polymer dispersed liquid crystal films for transmission mode spectrometer applications,” Appl. Opt. 46, 6277–6282 (2007). A. Y. Fuh and T. H. Lin, “Electrically switchable spatial filter based on polymer-dispersed liquid crystal film,” J. Appl. Phys. 96, 5402–5404 (2008). Z. H. Diao, W. B. Huang, Z. H. Peng, Q. Q. Mu, Y. G. Liu, J. Ma, and L. Xuan, “Anisotropic waveguide theory for electrically tunable distributed feedback laser from dye-doped holographic polymer dispersed liquid crystal,” Liq. Cryst. 41, 239–246 (2014). L. J. Liu, L. Xuan, G. Y. Zhang, M. H. Liu, L. F. Hu, Y. G. Liu, and J. Ma, “Enhancement of pump efficiency for an organic distributed feedback laser based on a holographic polymer dispersed liquid crystal as an external light feedback layer,” J. Mater. Chem. C 3, 5566–5572 (2015). Y. J. Liu and X. W. Sun, “Electrically tunable two-dimensional holographic photonic crystal fabricated by a single diffractive element,” Appl. Phys. Lett. 89, 171101 (2006). P. C. Wu, E. R. Yeh, V. Y. Zyryanov, and W. Lee, “Spatial and electrical switching of defect modes in a photonic bandgap device with a polymer-dispersed liquid crystal defect layer,” Opt. Express 22, 20278–20283 (2014). J. Lou, Y. Liu, S. J. Fu, X. D. Xu, and S. P. He, “Design of variable line-space plane gratings with holographic recording,” Proc. SPIE 5636, 551–559 (2004). J. W. Chen, S. F. Fu, D. K. Zhang, Z. F. Qi, S. Yang, and Z. J. Wang, “Producing grating with variable spacing,” Chin. J. Lasers 13, 291–295 (1986). H. F. Zhu, J. W. Chen, H. Y. Gao, H. L. Xie, and Z. Z. Xu, “A new method to produce high spatial frequency grating with variable spacing,” Acta Phys. Sin. 54, 682–686 (2005). M. H. Zhang, J. H. Zheng, K. Gui, K. N. Wang, C. H. Guo, X. P. Wei, and S. L. Zhuang, “Electro-optical characteristics of holographic polymer dispersed liquid crystal gratings doped with nanosilver,” Appl. Opt. 52, 7411–7418 (2013). 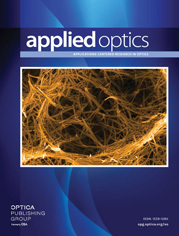 N. H. Nataj, E. Mohajerani, H. Jashnsaz, and A. Jannesari, “Holographic polymer dispersed liquid crystal enhanced by introducing urethane trimethacrylate,” Appl. Opt. 51, 697–703 (2012). Fig. 1. (a) Schematic illustration of the experimental setup for fabricating VLS H-PDLC gratings. (b) Interference pattern showing the varied strip within PDLC. (c) Diagram of varied exposure angles interacting on the sample surface. Fig. 2. Diffraction patterns of VLS H-PDLC gratings. We detected the diffraction on different positions of grating with x i = 6.4 , 4, 2.5, − 0.7 , − 3 , and − 6.1 mm . Fig. 3. AFM images of VLS H-PDLC grating samples: (a) Λ 1 = 1851 nm ( x i = − 3.3 mm ), (b) Λ 2 = 1695 nm ( x i = 3.1 mm ), and (c) Λ 3 = 1587 nm ( x i = 7.7 mm ). Fig. 4. Grating period as a function of the (a) exposure angle and (b) distance between the cylindrical lens and the sample. The lines represent theoretical results and the dots show experimental results. Fig. 5. Diffraction efficiency of gratings as a function of (a) exposure time and (b) recording optical intensity, as well as average diffraction efficiency values versus (c) exposure times and (d) exposure intensity. Fig. 6. Measurements for electro-optic characteristics of VLS H-PDLC gratings: (a) measured diffraction efficiency as a function of bias voltage and (b) measured rise and fall time. (4) U 2 ( x i , y i ) = A exp [ − i 2 π λ x i sin θ 0 ] . (5) I ( x i , y i ) = | U 1 ( x i , y i ) + U 2 ( x i , y i ) | 2 . (6) Λ = λ ( n − 1 ) · x i D ( n − 1 ) − R + sin θ 0 .